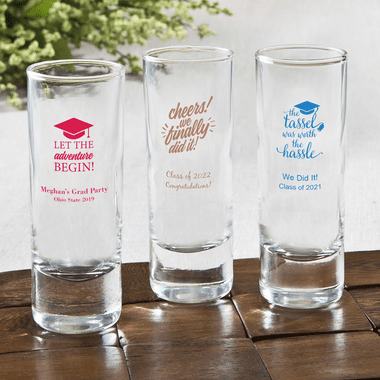 Toast the new grad with these custom college graduation shot glasses. A sleek tall and thin design, with a heavy base make these shooter style glasses a great bargain. Each measures 4" tall x 1.5" diameter and holds 2 ounces. Choose from a variety of grad graphics, fonts and colors to personalize your glasses.